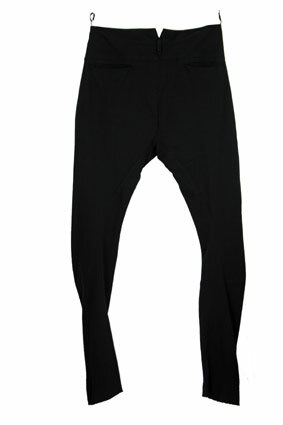 Masnada black cotton linen mix trousers,the fabric is superb. Slim twisted legs, that are right on the button. Slight cross-over at fly and fly is button fastening with beautiful black buttons. Belt loops. Side pockets angled from the side seams. Heavy duty metal staple detail by pocket, one each side. 2 pockets at the rear. Trousers are unfinished on length and can be left that way id preferred. Curved panel details. Seams inside are all taped French seams. Excellent trousers highly recommended.